See the Sun Lakes Arizona Oakwood Homes for Sale Now! If you are searching for Sun Lakes AZ homes, Oakwood homes for sale is one of the best places to begin. Oakwood Country Club is the newest of the five active adult retirement communities with 3,285 homes. If you want the newest community with a variey of home styles look no further than Oakwood homes for sale. Oakwood Country Club offers single style homes on the golf course, waterfront or with a private back yard. Or, choose a two-level home with main floor living. With two-level homes in Oakwood, the main living area and master suite are on the first level with a guest retreat and bathroom on the second level. Some people like the villa style living with one shared wall. In other words, the villa is a “lock and go” home where the homeowner association takes care of all exterior maintenance and landscaping. You simply unlock the door, enjoy the lifestyle and lock up when you are ready to leave. Oakwood homes for sale range are priced from $200,000 to over $600,000. And, you have access to resort amenities! 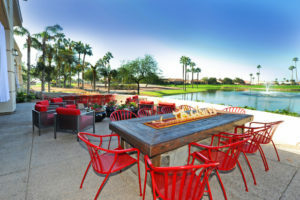 Oakwood Country Club in Sun Lakes offers 27 holes of golf, tennis and pickle ball courts, fitness center, walking paths, lakes, restaurants, bar, card clubs, hiking clubs and so much more! You will enjoy meeting up with neighbors and friends who share a similar interest. The Clubhouse offers great views of the lake, golf course and mountains and you will see spectacular sunsets from the bar or Stone and Barrel Restaurant. Enjoy Tribute Series concerts with the likes of Abba, Eagles, Doobie Brothers and many more. Many golf groups meet up on the Stone and Barrel patio after golf for cocktails, appetizers or a meal. 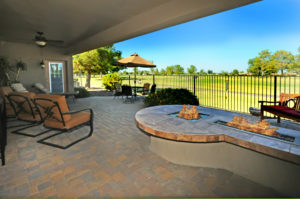 If you are looking for friendly people, resort amenities and the newest Sun Lakes AZ community, Oakwood homes for sale is the best place to start your search.